Most of these questions have been asked only once, but I have them listed here to help future visitors and adopters to understand what TWFA is about and how we operate. We are not like the bigger aviaries and breeding businesses as many people have come to assume so those expectations can lead to confusion ~ this page is designed to help alleviate that. Our goals, breeding programs and adoption processes are unique from many other breeders and potential adopters are encouraged to choose what works best for them. I always enjoy feedback and any questions you may come up with, so please feel free to contact me with anything you can think up! Why do you have a resting and breeding season? Have any of the birds you’ve sent to new homes ever gotten sick after they arrived? How can I tame my own Finch? Can I clip my Finch’s wings? Can I raise one of your babies/eggs by hand? Where can I find your testimonials? Why can’t I have the birds I want right now? Why are you asking me questions prior to adoption? Where can I find your current waiting list? Why do I see pictures of babies that you don’t have listed for sale? Why do you feed your Finches.. ? Where can I adopt Canaries? Where can I find parrots or other birds not found @ TWFA? 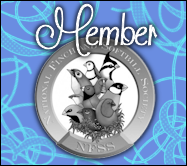 Can I breed birds that I have adopted from TWFA? I’m a first-time breeder, can you help me? 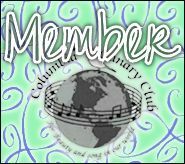 How do I become a TWFA Contributing Author? How long does it take to breed a pair of Zebra Finches? What is the difference between TWFA birds and other breeders? Isn’t breeding supposed to be a bad thing? Who is “we” or “our”? 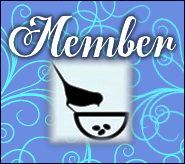 visit the Q&A page featuring Avian Veterinarian Contributing Authors. With many hobbyists experiencing illness or sudden death with their pet store (or even large-scale hobbyist website) bought Finches, this is a very fair question! I am happy to report that none of our offspring have ever arrived sick, and they have also never gotten sick after going to their new homes. We have had 0 reports of illnesses in any TWFA offspring since our opening, but we will always end up with a very small percentage of accidental deaths at the end of each season due to inexperience or honest mistakes. In fact, this year we had an adopter who experienced an outbreak of respiratory illness a couple of months after they adopted from us during the climate change from Summer to Fall which is very common when the weather changes too quickly. Their 1 TWFA offspring however did not get sick and still has not about a month later (along with other strong members of that flock). Many of us hobbyists have especially fragile members of our flock that need special care or monitoring, but our offspring are the exact opposite – very fat and very healthy (and happy!) compared to your typical Zebra Finch. If you’re talking about an adult Finch, even a young adult, then it is just not possible to tame them. Finches can only be truly tamed by raising them by hand . It is a delicate process and very risky but the reward is that your bird will always enjoy your company in a special way. The bond that you get from raising any animal by hand is immeasurable and unable to be replicated quite simply. Also take note of the fact that it is wrong to unnecessarily remove any babies away from their parents. It is traumatic for each bird and will often end in tragedy. Just because a Finch isn’t hand tame, does not mean they are not special! Please just enjoy the birds you have adopted and if you’re dead set on having a hand-tame bird then adopt one that has been raised by a skillful breeder. I will say that I have had many successful cases of nearly taming an adult Finch. This can be done through routine human socialization with Finches that are already comfortable with the interaction. In other words, if you notice a Finch is already eager to cozy up to you and enjoy your company or is prone to perch on or near you, they are a good candidate for trying to make “nearly tame”. This is very different than the birds who are raised by hand so they will never be truly tame, but they may learn to perch on your hand or shoulder which is why most people try to tame Finches in the first place. Never, ever ever, ever, clip a Finch’s wings. It is harmful, traumatic and pointless for them. If you are doing it in an attempt to try to tame them then I can tell you right now – that will have about a snowball’s chance in hell of working out. “Myth #10 – You can clip a finches’ wings to make it tame. No. No. No. No!! Never ever clip a finches wings. Finches are not parrots. They are not ‘sit on your shoulder’ or ‘eat off your plate’ type of birds. Those types of birds are called parrots. They are often bigger and louder than finches and they have large hook shaped beaks. The reason you can get away with clipping a parrots wins is because that parrots can use it’s nimble feet and strong beak to climb around the cage to gain access to food and drink when you are not home. A finch cannot do this. Sit and watch your finch for a moment. Notice how it hops and flutters its’ wings to get around the cage. Notice how it will fly to the side of a cage, grab hold of the bars then slide down a bit? These are all very big clues that without the ability to fly the finch cannot get around the cage. If the food and water dish aren’t on the ground you will quite litterly starve your finch to death if you clip the wings. I don’t separate babies from their parents intentionally, ever. Not for any adopter, rescue, or amount of money. In my opinion that is the wrong thing to do and is always both traumatic for the parents and their offspring. It also almost always ends in death of the babies. It may look easy and fun or you may assume it is so but it’s really a difficult and risky process that would at least take minimal experience raising Finches to even attempt. For starters baby Finches need to be fed every hour for the first 3 days of feeding, and then every 2 hours after that until they are weaned. Weaning can happen at around 4 weeks old but most of the time with hand-raised babies like the ones I currently have, they will wean at 8 weeks or more. That’s 2 months straight of 2 hour feedings – not a commitment to take lightly and not something anyone else can do for you. Though I wish someone would do it for me sometimes! I would also especially never remove babies so they could be raised by someone else in another location. I raise all of my offspring myself in my aviary and it is incredibly risky/unwise to try to remove babies and then send them elsewhere. That would be a death sentence. I also would never allow or recommend that someone who has never raised Finches before try to start hand feeding, especially with a baby from another aviary. I do however offer unrelated breeding pairs which will grow and mature to be ready to breed at 6 months – 1 year. I would recommend adopting a young pair from a breeder of your choosing and raising them for some time until you feel you are ready to breed. Once you have the experience of your pairs raising successful clutches on their own, then I would recommend trying to hand-raise your own baby. I would wait until at least 1.5 weeks to help ensure they will live through the process. It is VERY difficult to raise a baby from its first days of life, especially from an egg. To alleviate risking the life of your offspring, I would recommend waiting a week and a half or older which will not affect their imprinting or taming process at all. They will be the same level of affectionate and tame as the babies raised from day 1. Hope all of that helps! Here is some general care information. Here is a complete list of food items I use daily. Here is my article on hand-feeding/raising. Here you can find my “How to breed Finches” tutorial. I am not a mass breeder or a “farm” that produces a large amount of birds without any care as to where they end up or how. 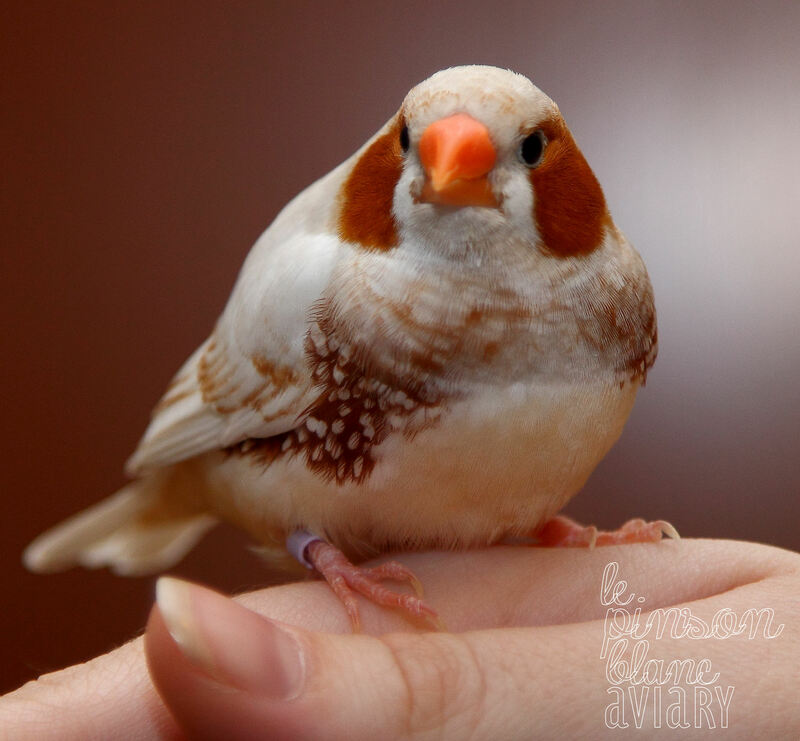 I aim to raise the highest quality of loving & healthy pet Zebra Finches and the rarest mutations with great attention to detail for each hatchling and pair. This means that I breed throughout a controlled season and when I’ve been having great success such as I have experienced this season, then I will have a short waiting list of some kind. That being said if you expect me to have pairs for you immediately or not at all when there is a list of people ahead of you who have already completed the screening process and are waiting for their pairs then I recommend finding another breeder. There will be times when I have multiple pairs ready to go to homes immediately but luckily thus far in the season that is not the case. I care very deeply about where my offspring ends up and in the hands of whom I trust my genetics. This means that I pre-screen adopters and may have a short waiting list for pairs but as you can see I am regularly breeding and will have more pairs on the way. I am more than happy to adopt out to every bird lover, but I do expect a little patience, humility and respect that I try to provide all potential adopters in return. The current waiting list can be found in the Available Now section. If I don’t hear back from a potential adopter then they are moved to the inactive list. I understand that sometimes emails are forgotten, plans are changed, etc. so this inactive list is a courtesy in case of such delays. It is best for adoption purposes however that all offspring are sent to their new homes as soon as possible. For this reason the adoption list needs to stay current and potential adopters are regularly contacted with updates. Not all of our offspring are available for adoption to the public. TWFA is a private, in-home aviary run by a hobbyist and not a mandatory public service. Some babies go to pre-determined homes or are traded with other breeders, while some stay here in our aviary. This especially is true with rare offspring such as a hand-tame baby or one with extraordinary markings. We may even send offspring to a partner breeder/family member for their flock or for breeding at a separate location. We also have specific pre-determined homes where we retire our older pairs. If you would like to adopt a retired pair or one of our current pairs when they retire, contact me. So if you see a photo of a hand-tame or other extraordinary baby in our aviary and demand that it be sold to you, it is most likely already happy in its new home. Most TWFA offspring are already spoken for thanks to our waiting list system. If you’d like to adopt a pair, download the application and send me an email. I have listed most of the TWFA diet on this site, but there are other elements, programs, treats and seasonal additions that I will not list and are exclusively for this aviary formulated through years of experience and recommendations. 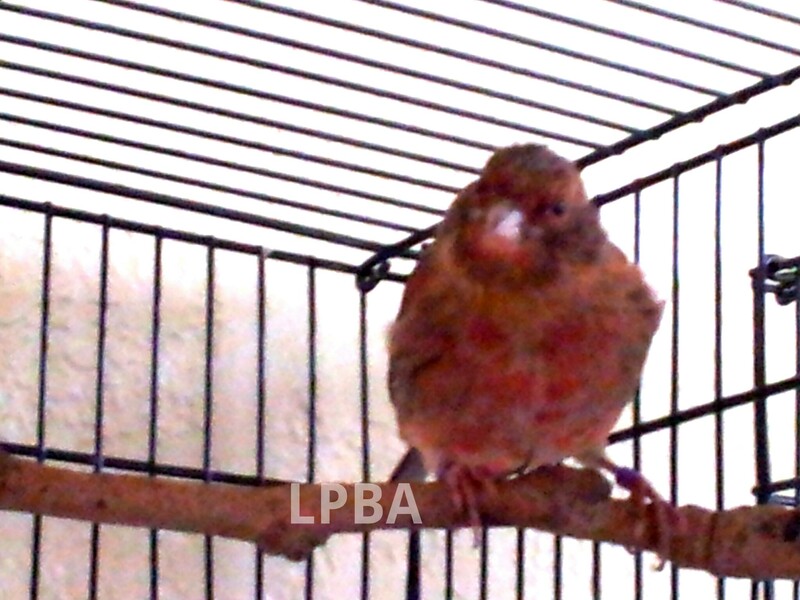 TWFA-born Finches are more vibrant than you will find with other breeders. This is due to key factors in their diet – the same answer applies to their “fat”-looking size and energy. The bottom line is there are things that a plain seed diet just can’t do. The best comparison I can provide would be the equivalent of taking vitamins and eating healthy VS eating a “fast food” saturated diet. “Fast food” is a lot like some store-bought Finch food items that may be cheaper and easier to attain. If you eat well, you are still lacking some of the nutrients that vitamins supply. So while health isn’t dependent on vitamins, it still vastly improves its quality. In the end we all do what we have to for our pets and make our own decisions regarding their care. I feed my Finches what I do because I have tried many other items and this is what works best in my experience. Unless you have written permission from me and we have discussed your breeding plans, I prefer that adopters do not breed their birds. I will regularly provide sibling pairs for adoption because they make great pets that bond very closely with each other and their owners. I always alert adopters to the mutation type and lineage of each bird but some are excited and forget such info. The breeding process is a full-time commitment that will usually deter people who are not ready for it from keeping Finches altogether. Breeding also places stress on pairs, especially hens. Please, for the sake of your pets just enjoy them and leave the breeding to the experienced. Or at the very least, spend the time doing your own research. I am happy to provide unrelated pairs to fellow hobbyists of all experience levels (I also accept trades). I also provide detailed care information throughout this site based on my personal experience. I provide round-the-clock answers and advice for all adopters, and am happy to guide first-time breeders if they discuss their intentions honestly during the screening process and adopt unrelated pair(s). Green Forest Aviaries has wonderful breeding lines as it is clear to see from some of their photos. The owner has quite a talent with offspring available regularly throughout his breeding season. He has far more than the typical colors you would expect in a Canary, some mutations I did not even know existed. They are all spectacular in their own right but my favorite has really become the Brown Red Mosaic Ino. 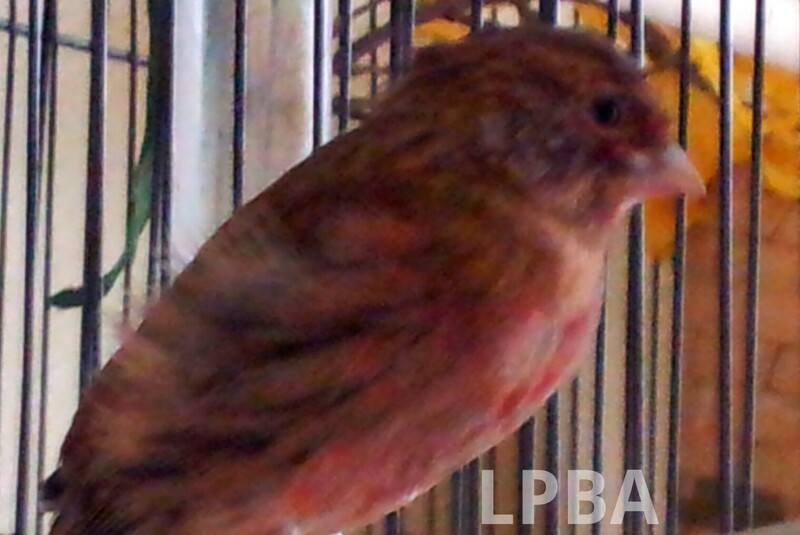 His Red Factors are absolutely the brightest red I have ever seen in a Canary, just stunning and raised really well. Specifically with first-time breeders who have not adopted from TWFA, I try to stay out of their initial experience. It is the responsibility of each breeder to do their own research and spend the time getting to know what they will need for their own breeding program. There are far too many options out there for me to decide for anyone. The best way I can describe it is – it’s like parenting. You have to choose your own options and methods that best suit you and your beliefs. So while I will point first-time breeders in the right direction, I encourage them to do their own research first and make their own decisions. Breeders who do not do their own research and who gain all of their knowledge through the recommendations of others are subject to misinformation, gaps in knowledge and deaths in their cages. TWFA adopters who express their intent to breed during the screening process are able to contact me any time with any questions or concerns and are the only first-time breeders I will take great care in assisting. This is partially due to the fact that they have already been approved to breed TWFA offspring, and also because they have ensured that they will provide the best of care to their new pets as well as any young they will yield in the future. This system enables me to give first-time TWFA breeders lots of attention on a one-on-one basis which would not be possible if I allotted the same amount of time to any first-time breeder that asks for info (there are dozens each month). 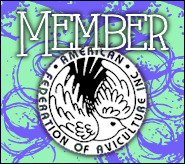 To become a TWFA Contributing Author, contact me: whitefinchbreeder@gmail.com with a short message as to which section you’d like to contribute to, why and your experience on the topic. That all depends on the Finches! Here is my process: I adopt my pairs from other breeders, quarantine them, medicate them, and then pair them up. If they are TWFA-born, I pair them as juveniles and wait until they are of a proper age to breed. Once they are paired up and I am positive they are a good match after monitoring their behavior, I begin work on their breeding condition. It can take weeks or months for a new pair to hit their peak in conditioning – this is usually the hardest and most tedious part in the process. It is accomplished through exercise, proper diet, vitamin supplements, and other programs. TWFA-born pairs, however, are ready to breed as soon as they are of age. They are colored before they fledge, molt before they’re 2 months old and appear to be healthy, happy, friendly and fat little birds. I’m always very proud of our fertile babies! I recommend however that they are not bred until they reach about 6 months of age or older. 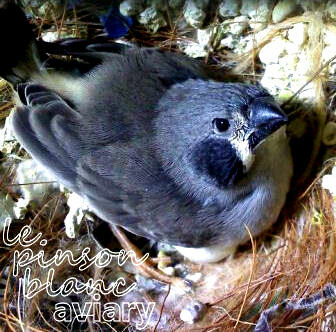 Since TWFA is a small in-home aviary and not a mass-breeder most requests are filled throughout the breeding season. It can take a while sometimes with newer pairs to produce fertile clutches, or it can take a while for them to get their parenting style down. They make mistakes too! First-time parents may have mishaps like forgetting to incubate their eggs, forgetting to rotate them, leaving their nest for too long, etc. Even seasoned pairs sometimes need to ‘get back in the hang of things’ and can start the breeding season slow. This isn’t a frequently asked question (it’s a once-asked-question), but I thought it would be a good one to answer in case anyone asks again in the future. I am, and always have been, only me. I am not hiding behind an internet persona. You get exactly what you see on this website. Multiple people in the Aviculture community know my name and have known it for years. I don’t include my full name on any of my website information as a personal preference, not because I’m hiding my identity. Once adopters complete the screening process and have paid their re-homing fees they will find out my last name. It’s linked to my Paypal and any sort of shipping order I create. I’ve been at the same URL for over 3 years now and I have never operated under any other names. I’ve always been Chelsea @ LPBA or TWFA since I began adopting, rehabilitating and re-homing birds. If you feel for any reason that the information I have provided on my website is not enough to meet your standards, then feel free to choose another breeder. I post all of my references which are listed as reviews on the Testimonials page and don’t have the time to go through an additional self-screening process on top of my adopter-screening process. 🙂 It is up to each and every adopter to pick a breeder that works for them that they can trust, it’s not the responsibility of the breeders to try to win over every single potential adopter – that is done through their actions, programs, websites and reputations. Every TWFA-born baby benefits from each of our unique programs throughout their lives through conception, incubation, birth, weaning, juvenile-hood and becoming an adult. I have listed most of the TWFA diet on this site, but there are other elements, programs, treats and seasonal additions that I will not list and are exclusively for this aviary formulated through years of experience and recommendations. 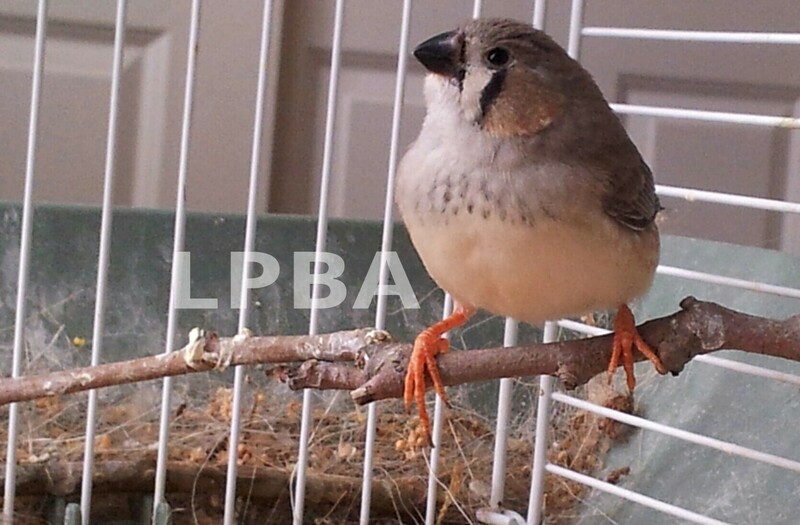 TWFA-born Finches are more vibrant than you will find with other breeders. This is due to key factors in their diet – the same answer applies to their “fat”-looking size and energy. TWFA-born Finches are also friendly due to the time taken to socialize them. As with all birds, Finches always take time to gain trust and show affection in a new home but after some hard work and patience – they are very loving. The pre-adoption screening process may seem lengthy and detailed at times but it’s entirely necessary. In fact – it’s vital that each adopter is evaluated to ensure that they are receiving the birds that best suit them and their life style. It is also important to ensure that all adopters fully understand and are capable of bearing the burden of Finch ownership. Most breeder’s don’t have a screening process. That is fine and works for them. 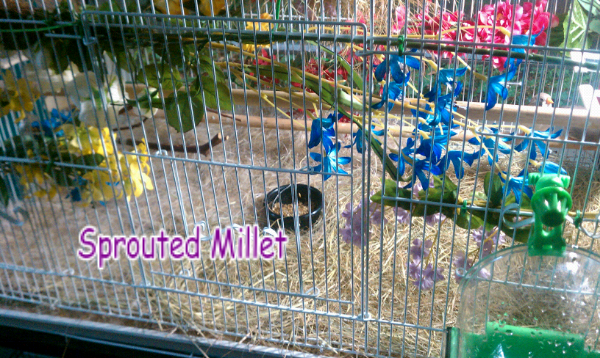 I care very much about where my aviary offspring end up – more than I care about any profit. Therefore, I take a lot of extra time ensuring the adoption. Every single bird raised at TWFA comes from years of hard work and dedication. I place offspring in caring homes for the love of the species and to benefit the community, not because I need the money or the space. I have enough space and funds to keep every hatchling myself for many seasons to come as every breeder should. Offering offspring for adoption is a choice and a privilege, and at times I may choose to keep offspring. My main goals in breeding are to better the species and provide quality pets to the avian-loving community. Breeding benefits the local economy, creates jobs and yields some of the most outstanding pets who are prime examples of their species. It is a practice that is intended to better the species and provide a service to animal lovers to enjoy the offspring bred to become pets. The negative connotations associated with breeders come from the neglect and carelessness of misguided people. In reality breeders are held to a very high standard by perspective adopters, local, state and national agencies, and the general public. With the internet, media sharing and social networks of current times it is a lot easier to gain insight into the programs, pairs and husbandry that breeders are using. This keeps them in check and publicly accountable for their practices. Other negative connotations associated with breeding include the idea that home-bred animals put shelter animals to death – taking their place in adoptive homes. There are many people however who adopt from breeders as well as shelters and many breeders who also rescue. The fact of the matter remains that it is the choice of the adopter to pick a pet that best suits their desires and lifestyle. They decide from whom they wish to adopt from, and why. As long as there is a need for breeders and their high quality pets which come from years of dedication and experience – they will remain an option and quality breeders will remain in business for decades. “We” or “our” can mean the TWFA family of adopters, our team of various contracted specialists, fans and visitors, or the people behind the scenes of this in-home aviary ~ my fiance & I. We have been raising and caring for birds for a combined total of about 20 years since each of our childhoods and will continue to for the rest of our lives. A resting and breeding season cycle is incredibly important to any breeder of any species. This enables your birds to have a more naturally occurring reproduction stage. In the wild, they are not breeding 24/7 so in captivity that is not how they should be allowed to breed either. They need regimented periods throughout the year so they can stay fit both physically and mentally. The breeding season for TWFA is during the Jan/Feb-Sep/Oct time of year. The resting season lasts from 3-4 months or longer depending on what’s happening at the aviary. Why do we breed during good weather when we are an indoor aviary? For some people, our good-weather schedule can be slightly confusing. We are an indoor aviary, shouldn’t we take advantage of the natural Zebra Finch breeding that occurs in the winter time?? Personally I have always been taught to match your season to the local standard of your peers. This is not only to “blend in,” it’s also out of mere respect. Here on the West Coast, most of the avid Zebra Finch breeders are located in CA and keep a good-weather schedule where breeding does not occur in the coldest Winter months (if you can call CA weather “Winter”!!). If I were to breed during those months it would take away business from them, especially because I offer shipping while many do not. This may lead to preference of TWFA over others just because I am constantly open or open while others are closed. That is not what we are about!! I want to promote my brethren (though most on this coast have FAR more years of experience under their belts and don’t need my help! ), not hinder them or try to separate myself. This is not by any way my method of calling others out who are doing what I choose not to either, they’re more than welcome to their own opinions.